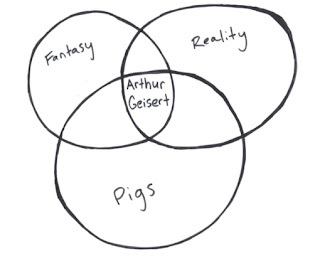 If you don't know the work of Arthur Geisert, please click on his name for my reviews of his books. He is truly an amazing author and artist with an incredible imagination. His picture books will be on the shelves decades from now, maybe next to those of Richard Scary and Maurice Sendak, providing they aren't shelved alphabetically. 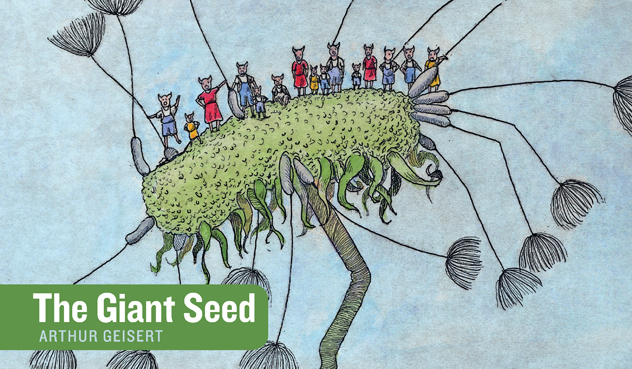 If you do know Geistert's work, then you have been waiting anxiously for The Giant Seed. While not all of Geisert's books are wordless, this is his second book for Enchanted Lion Books's fantastic series Stories Without Words. 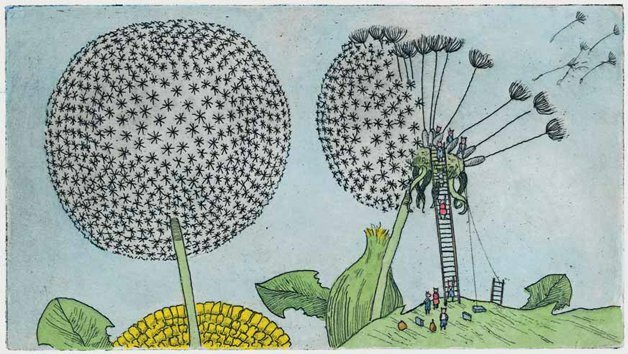 As always, Geisert illustrates The Giant Seed with etchings, giving it a detailed, distinct look. The Giant Seed finds us back on the island of pigs. One night, in the glow of a full moon, a giant seed alights on the island. The pigs approach it, shovels in hoof, and set to work planting and watering it. Fortunately, this seed grows like a weed - because it is one. The enormous dandelion thrives and blooms, and just in time, too. The pigs approach this natural disaster they way they do everything - with a plan. I don't want to give away the whole story, but how they save themselves and the brilliant role that the giant seed has to play in it will delight readers young and old and have you flipping back to the beginning of the book to read it again. The Giant Seed is also reviewed at 100 Scope Notes where librarian Travis Jonker shared this awesome diagram in his review of Geisert's book Ice last year. If you find wordless picture books intimidating and difficult to read out loud or are seeking to deepen your appreciation of them, check out my article How to Read a Book Without Words (Out Loud). For more great wordless picture books, click this link: Stories Without Words or read my reviews of the books by masters of this genre, Barbara Lehman and Bèatriz Rodriguez.